ImageSkill Tile Builder: Create amazing symmetry patterns by one click! 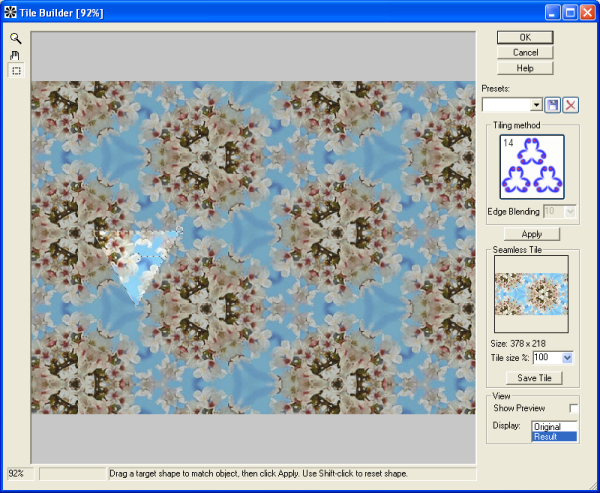 Tile Builder is a Windows Photoshop-compatible plug-in for creation seamless patterns using symmetry rules. It will be useful for web designers, artist and computer graphics enthusiasts. It allows you create fantastic patterns by one touch. Run Tile Builder, choose one of 17 tiling method, press Apply and you receive incredible result! Our plug-in has unique flexibility and power. You can save generated seamless pattern as BMP, JPEG or PNG file for using anywhere. Tile Builder processes RGB and Grayscale images with 8 or 16/bits channel. Plug-in has simple install and de-install procedures and automatically detects suitable graphics hosts. ImageSkill Tile Builder is compatible with Adobe Photoshop and Photoshop Elements, Corel (Jasc) Paint Shop Pro, Corel Painter, Corel Photo-Paint and Microsoft Digital Image Suite. ImageSkill Tile Builder runs on Microsoft Windows 98/ME/2000/2004/XP/NT3/NT4. The full version of ImageSkill Tile Builder is available in English for $24.95 including VAT.